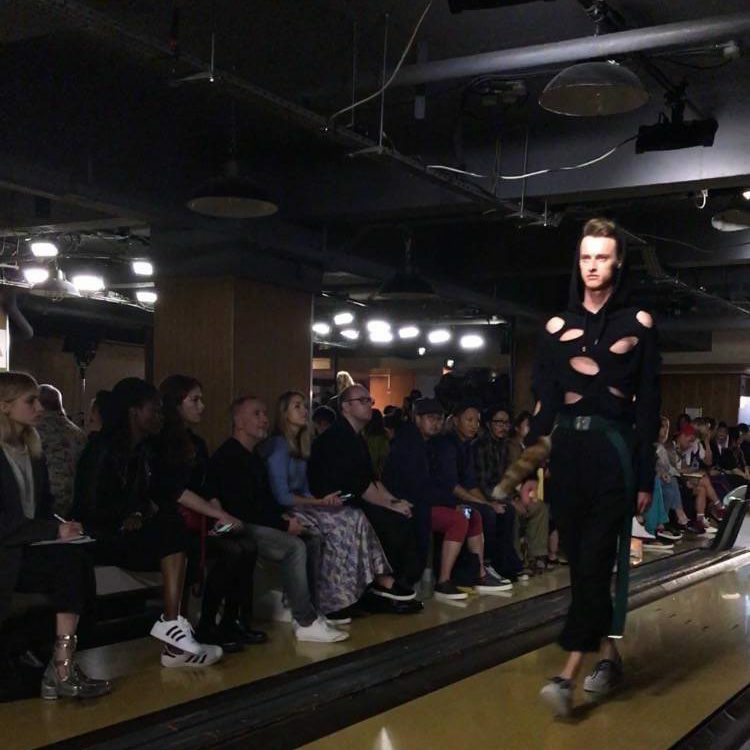 With a catwalk show held in Bloomsbury Bowling Lanes, it was evident from the offset that Mihara Yasuhiro’s clothing would be edgy and contemporary. 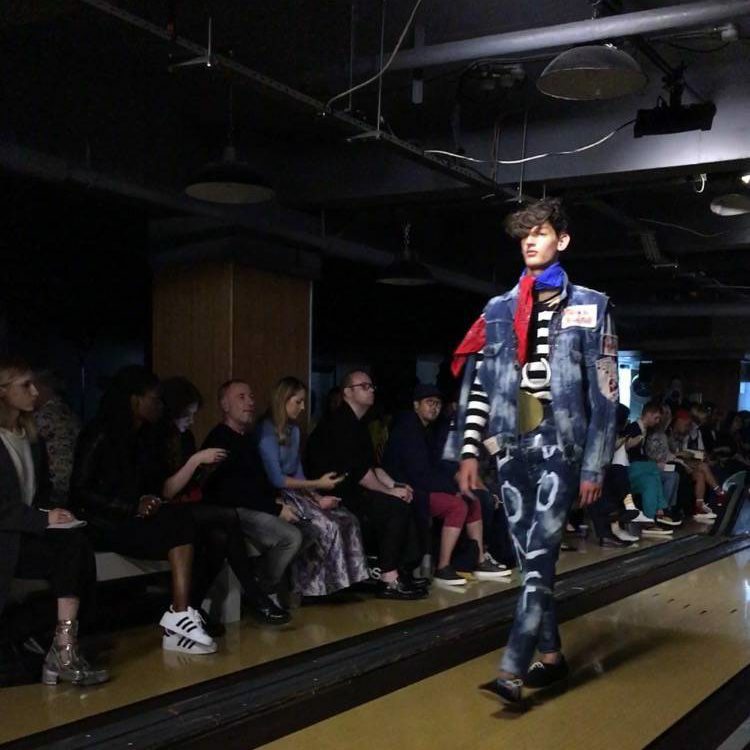 The inspiration behind his SS17 collection, ‘NO CLUB LONE WOLF’, was the book ‘REBEL YOUTH’ by photographer Karlheinz Weinberger. In it, Weinberger presents working-class teenagers in the late 1950s and 60s, who each crafted their own individual look by utilising elements of American pop culture imagery. Yasuhiro therefore tries to capture this desire for nonconformity and originality in his collection. 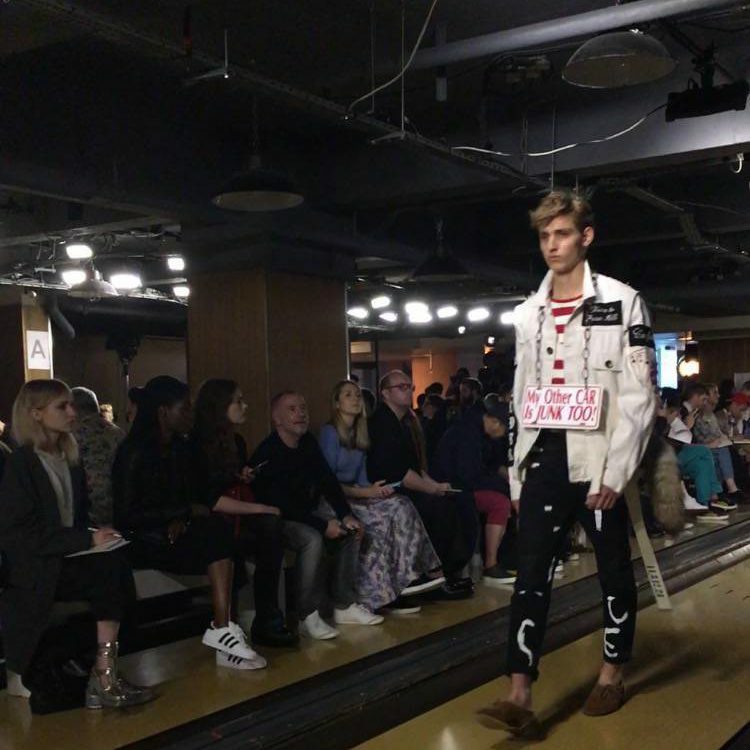 With items such as embroidered and hand-illustrated biker jackets, long line silk shirts, distressed sweatshirts and updated rubber soled sneakers, Yasuhiro is trying to equip the current generation with the same tools for individuality that the ‘REBEL YOUTH’ teenagers had. Most of his clothing this season was asymmetrical and more often than not, trousers and jackets were branded with ‘NO CLUB LONE WOLF’. Details such as oversized zippers and dangling straps were also included to really push this idea of unapologetic uniqueness to the forefront. The colour palette also varied greatly but still remained wearable. Yasuhiro chose a mix of simple block colours, such as cream, grey, black, navy and maroon, and prints such camouflage, checks and stripes. Accent colours of yellow, red and royal blue were also added, usually in the form of a neck scarf. Although some of the looks were probably too busy for everyday wear, there’s nothing wrong with a good statement piece. For anyone who wishes to express their identity through fresh and innovative clothing, Maison Mihara Yasuhiro would definitely suit their needs.